RPT - The first day of early voting is upon us! 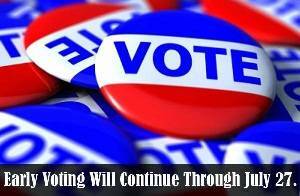 Polls are now open through today, July 23rd through Friday, July 27th. Get out and vote! Click here for a full list of the candidates and races. Click here for a full list of voting dates, and click here for a polling location near you. Beyond the important task of selecting our next Republican U.S. Senator, new members of the Congressional delegation, and the statewide and local races that impact our daily lives, this July 31st runoff features an important vote to the grassroots of the Republican Party of Texas - the election of GOP precinct chairs across our 254 counties! Many thousands of dedicated grassroots leaders are depending on you to turn out and bring your friends and family with you to make your voice heard over the next several days of voting. Texas Republicans have persevered through many unusual changes to our voting calendar this year and we have one more week to go before we know our nominees for November. While the statewide races will help to boost turnout, there are a number of local races occurring in counties throughout the state. All of these races and candidates are important for the future of strong, conservative government in Texas and every voter who turns out steps forward as another supporter of the Republican Party's ultimate goal for victory in November! Besides the statewide races, there are Republican runoffs for five U.S. Congressional seats in districts that have been created or heavily affected by redistricting and there are 14 State Legislative runoffs on the Republican ticket which will help shape the course of our State for many years to come. Please help the Republican Party of Texas and your Republican nominees by helping turn out the vote in these final days. Early voting is a convenient and important component of this runoff election and with so much at stake - it is important that our Republican voters across the state to turn out in strong numbers for this important election. We know you are busy with obligations and commitments, but early voting helps ease the stress of finding time at the last minute to make your voice heard. The unusual timing of the runoff in the middle of the summer may find GOP voters on vacations or render their thoughts absent of political thinking, and the Republican Party needs your help to spread the word. Get your friends, family, and co-workers out to the polls today until Friday, July 27th, 2012 to participate in this crucial runoff election, to help choose our Party's nominees, and to help us move forward towards the goal of getting our country back on track this November. We cannot be successful without your help - thank you!